The Supper of the Lamb: A Culinary Reflection is by an Episcopal priest, husband, and father named Robert Farrar Capon. It's quirky, opinionated, and beautifully written. I highly recommend it. 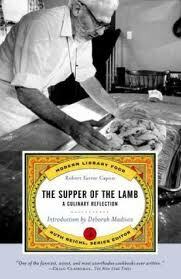 Capon spends several chapters telling how to make a meal for 8 four different times out of a single leg of lamb: Main ingredient: "1 leg of lamb (The largest the market will provide. If you are no good with a kitchen saw, have the chops and the shank cut through. Do not, however, let the butcher cut it up. If he does, you will lose eight servings and half the fun.". There's an ode to baking soda, a jeremiad against electric serving knives, a reflection (generated by his wife's learning to make spaetzle) that we should either fast or eat to our heart's content, but on no account should be engage in the kind of angst-ridden persnickety calorie-counting that drives ourselves and everyone else crazy. "There, then, is the role of the amateur: to look the world back to grace. There, too, is the necessity of his work: His tribe must be in short supply; his job has gone begging. The world looks as if it has been left in the custody of a pack of trolls. Indeed, the whole distinction between art and trash, between food and garbage, depends on the presence or absence of a loving eye. Turn a statue over to a boor, and his boredom would break it to bits—witness the ruined monuments of antiquity. On the other hand, turn a shack over to a lover; for all its poverty, its lights and shadows warm a little, and its numbed surfaces prickle with feeling." For somehow, beneath this gorgeous paradigm of unnecessary being, lies the Act by which it exists. You have just now reduced it to its parts, shivered it into echoes, and pressed it to a memory, but you have also caught the hint that a thing is more than the sum of all the insubstantialities that comprise it. Hopefully, you will never again argue that the solidities of the world are mere matters of accident, creatures of air and darkness, temporary and meaningless shapes out of nothing. Perhaps now you have seen at least dimly that the uniquenesses of creation are the result of continuous creative support, of effective regard by no mean lover. He likes onions, therefore they are. The fit, the colors, the smell, the tensions, the tastes, the textures, the lines, the shapes are a response, not to some forgotten decree that there may as well be onions as turnips, but to His present delight—His intimate and immediate joy in all you have seen, and in the thousand other wonders you do not even suspect. 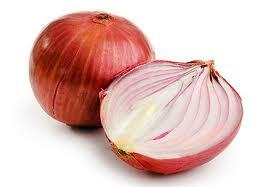 With Peter, the onion says, Lord, it is good for us to be here. Yes, says God. Tov. Very good." yummy review in multiple regards. Waiting to hear what your reader JP thinks.